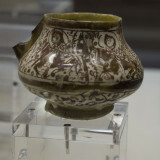 In the museum complex that includes the Archaeological Museum and the Museum of the Ancient Orient we also find the Çinili Kösk. Çin is from Cina, and means "tile" in Turkish. Çinili is "with tiles", Kösk is the word we know as "kiosk" and means something in the region of "villa". 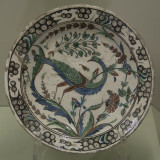 It is the name for a building from 1472, and houses the most marvellous collection of Turkish ceramics. It is here that I fell in love with the great colours and beautiful ornamentation of the best of Turkish tiles, mosque lamps, plates et cetera. 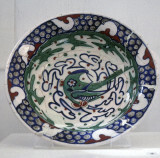 See also my galleries on Iznik, and on Kütahya, the town where much of the modern (re)reproduction of this art form is situated. The quality seems to be improving fast, one can buy very good copies of old designs at reasonable prices all over the country. March 2006 I took some new pictures with a digital camera. The exposition had been changed considerably, as a result I could get closer to some of my favorites (and didn’t see some others, that I luckily saw earlier). You may notice changes in colour, I still find it difficult to reconstruct the colour as I saw it, what with all the different colours of artificial light. Çinili Köşk, Arkeoloji Müzesi ve Eski Şark Eserleri Müzesi’nin içinde bulunduğu müze kompleksinde yer alıyor. Çinili Köşk, 1472’den kalma bir binanın adı ve bu bina Türk seramiklerinin en mükemmel koleksiyonuna ev sahipliği yapıyor. En iyi Türk çinilerinin, cami lambalarının ve tabaklarının harika renklerine ve güzel süslemelerine burada aşık oldum. Bu sanatın modern tarzda (yeniden)üretildiği şehirler olan İznik ve Kütahya, galerilerimi de inceleyebilirsiniz. Yapılanların kalitesi hızla artıyor; ülkenin her yerinde eski desenlerin çok iyi örnekleri uygun fiyata bulunabilir. 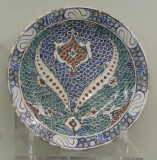 I have the feeling this is partly because the pigments were easy to prepare and handle, partly because of the strong influence of Chinese porcelain. 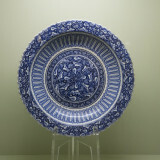 I'm Dutch, Dutch porcelain and earthenware also strove to immitate Chinese white and blue porcelain, hence "Delfts Blauw" (Delft Blue). Why is there so much blue in Turkish/Islamic tiles? What does the color blue symbolize? How is the color turquoise associated with Turkey?